Schizorhiza is a monotyphic genus found in the Southwestern Cape of South Africa in the Iridaceae family described by Goldblatt and Manning in 2015 when Lapeirousia was broken into 4 genera. Lapeirousia was retained and the other two new genera described were Codonorhiza with seven species and Psilosiphon. Psilosiphon was renamed in 2016 as Afrosolen. Schizorhiza at first seemed to belong to Afrosolen because of the corresponding floral and seed morphology although geographically distinct since that genus is found in tropical and eastern southern Africa, but its leaf anatomy and corm morphogy is unique. Schizorhiza has corms with corky to papery tunics; Lapeirousia corms are woody and Codonorhiza and Afrosolen corms have compacted fibers. Chromosome numbers differ from Lapeirousia which has x = 8 or 9. Schizorhiza's basic chromosome number is x = 6. Schizorhiza neglecta (Goldblatt) Goldblatt & J.C.Manning, syn. Lapeirousia neglecta Goldblatt, is known to just three populations in Bainskloof, Jonkershoek and the Steenbras Mountains in the Southwestern Cape, South Africa, where it grows in rocky sandstone deprived soil at 400-1000 m in spots where additional moisture is available. It flowers in early summer (mid November to late January) following a fire the previous summer or autumn. 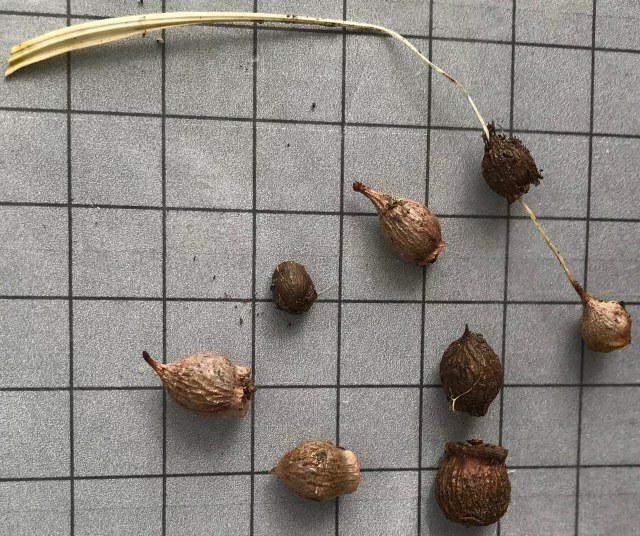 Corms have corky layers and are ellipsoid with small flat bases producing several new corms in place of the parent corm at the end of the growing season. The 3-6 leaves are sword shaped to linear, slightly pleated with a prominent vein; the lower leaves are longest and inserted below ground level. The stem is branched with cormlets produce in the leaf axils above and below ground. 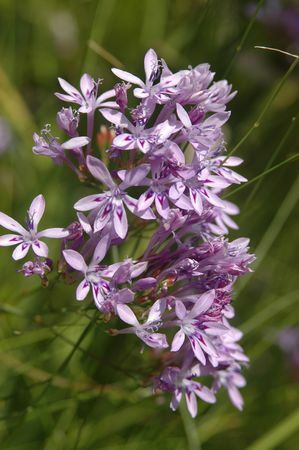 Flowers are bilaterally symmetrical in an open panicle and either white with lower tepals with one or a pair of purple median spots (Jonkershoek population) or blue with darker blue to violet spear-shaped markings in the lower midline and often white-dotted in the center of the dark color (Bainskloof population). The first photo was taken by Rod Saunders of plants from the Bainskloof population. The second photo by M.Gastil-Buhl shows seeds acquired from Silverhill Seeds 46 days from sowing on a 1 mm grid. 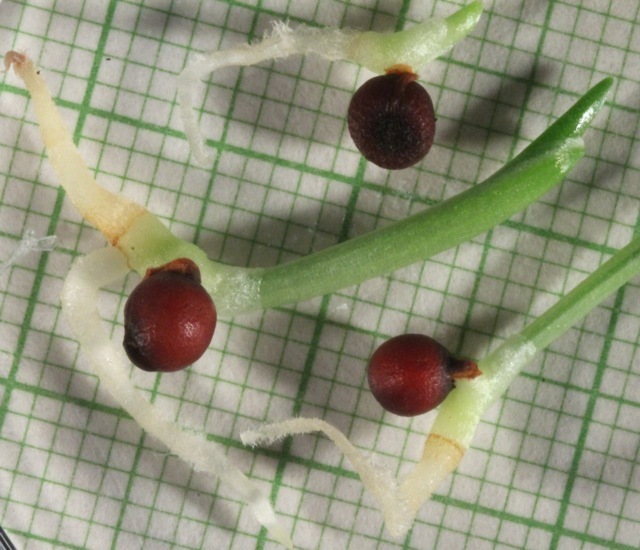 The third photo shows corms grown from those same seeds, on a 1 cm grid.